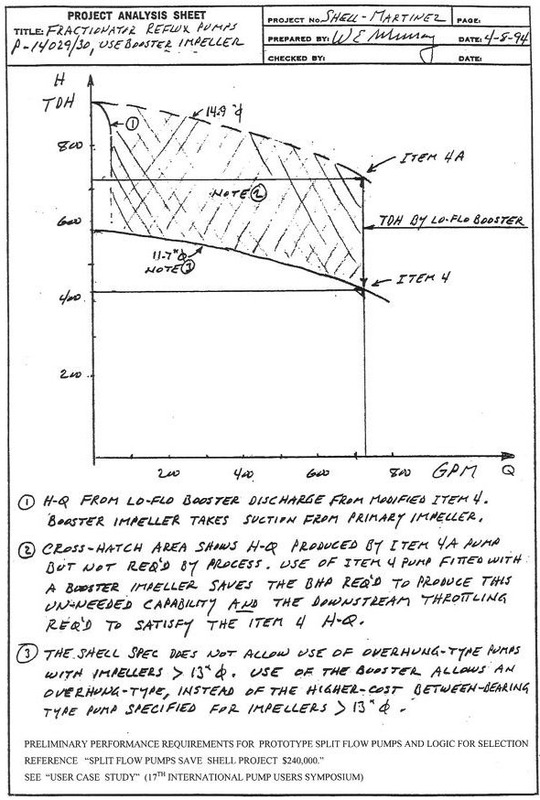 During the development of the Martinez Heavy Gasoline Hydrotreater (HGHT) project, it was discovered that there were two pump applications (P-14029/30) for the same process stream. One application was a large flow and moderate head while the second application was for very low flows (7 gpm) and a higher head (approx. twice the lower head). The project engineering flow diagrams were developed with two sets of pumps for fractionator reflux service. Since the process liquid was over 3OO°F, both sets of pumps needed to be high-temperature API pumps. The rough cost was $40,000 per pump with an installed cost of over $100,000 each. After the final hydraulics were developed, it was quickly realized that an API pump operating at 7 gpm was not a very good selection. So, other alternatives were investigated. Bechtel’s machinery engineer, Bill Murray, proposed developing a new pump design where both applications could be handled in the same pump casing. This would eliminate the need for the two smaller pumps at a project saving of approximately $240,000. BW/IP agreed to work with Bechtel and Shell to develop a pump (Split Flow) where a slipstream from the main pump flow would be boosted to the higher head using a drilled-hole type impeller. This impeller was sized to provide the required head & flow and could be run dead-headed thus eliminating an expensive minimum flow bypass system for the slip stream. The pumps were fabricated, tested and started up with the HGHT. They have been running since start up (June 1996) with no operating or maintenance problems. The Bechtel engineer applied for and received a US patent for the Split Flow design. 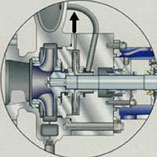 Split Flow™ pumps use 60 hp motors. Conventional pumps for this fractionator reflux service would have used 125 hp motors. Use of the smaller motors results in an annual kW saving of $25,000 for this installation. Innovative Low Cost Pumping Solution Proved to be Reliable. By Van Wilkinson, Shell Chemical Company, Houston; and Bill Murray of Split Flow. Presented at the 17th International Pump Users' Symposium, March 6-9, 2000, Houston. See more graphs and diagrams from the Shell case study. Conclusions: For this application, a single pump for two process services offers lower initial capital costs, improved energy efficiency and good equipment reliability. It meets API 610 selection criteria with shaft deflections at the seal similar to standard pump design.